Sam Kibula started in the second-row in his first game on loan for Dewsbury. The towering forward, who has joined the Rams for a month, couldn't prevent the side going down 22-17 to a star-studded Toronto Wolfpack. Kibula, who made his debut last season, is one of several players who have been sent on loan because they are too old for the Under-19s, and plans for a revived reserves league didn't get off the ground. Callum Field, who is also at Dewsbury for a month, came off the bench in their loss to the promotion-chasing Wolfpack. Four Wigan players were in the Swinton side edged out 18-16 by Halifax. Halfback Harry Smith, who is on loan at the Lions, kicked two goals. Chris Hankinson, Liam Forsyth and Josh Ganson all figured on dual-registration - which operates like a week-to-week loan arrangement. Josh Woods started at halfback as Leigh went down 9-8 to York. 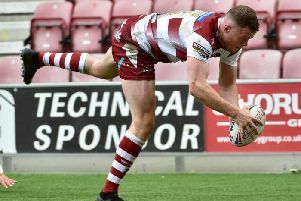 Woods is on a season-long loan with the Centurions. Meanwhile, on Friday, Sam Grant was in the London Skolars side beaten 48-12 by Newcastle in League One.